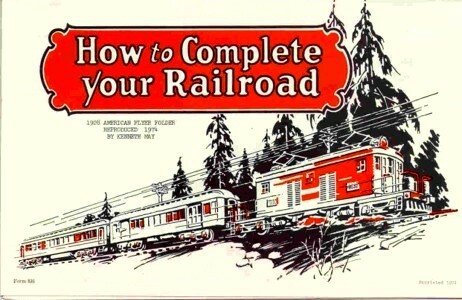 1928 American Flyer Catalog Reprint Mint Condition - $7.50 : Olson Hobbies, Welcome To The Train Page! 1928 American Flyer Advance Catalog. This is a reproduction from 1974 made by Kenneth May, in two color. Some of the products shown in this Advance Catalog are the 1348 Ambassador and 1473 Statesman. The top of the sets was the 1489RC President Special Passenger with cab electric loco, that was equipped with ringing bell and remote control. A line of trackage and signals is also offered. This unfolds into approximately 11 x 24 inches.